Netflix Original reality series "Made in Mexico" shows a different side of Mexico's culture by following the lives of several Mexican socialites. The reality displayed on screen is something that isn't just relatable by other socialites or Mexicans, the stories are more down to earth and humane. Columba said that they are real and raw emotions and stories in the series. The cast wouldn't have agreed to do the show if it was scripted or fake, Roby said. The cast shows not only the best part of themselves, they allowed themselves to be vulnerable and show everything that happened as it was happening and not allowing themselves to censor or sugar coat things. The stories of each socialite has it's ups and downs and can be seen from the first episode that there's no holding back. Kitzia said that there were points where she wanted to the cameras off, or that she wanted some alone time, but that isn't possible on a reality series. Roby said that for the first few months he wanted to quit at the end of the day, but he had to pull through for the cast. The cast agreed to do this as a unit and continued through it as a unit. The cast had to lean on each other for support and strength, there was no turning back from this endeavor. Columba said that the entire cast became a family. having the cameras there was difficult, exhausting and exciting, but the worst part was how draining it was afterwards. The vulnerability the cast allowed themselves to have was therapeutic, Kitzia said. 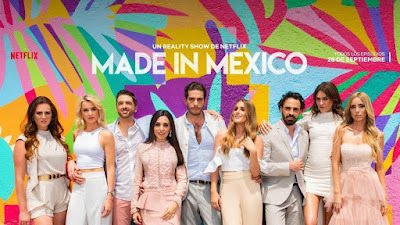 The cast hopes that this reality series will be enjoyable for viewers and that people learn that life in Mexico isn't how it's portrayed and that the stereotypes people may have about Mexico will be broken.